Washington Redskins tight end Niles Paul is back at Redskins’ OTAs. Originally drafted as a wide receiver in 2011, he converted to tight end prior to the 2012 season. He’s played just eight games in the last two seasons due to injury. With Jordan Reed sidelined, Paul had the most productive year of his career in 2014, catching 39 passes for 507 yards and a touchdown. 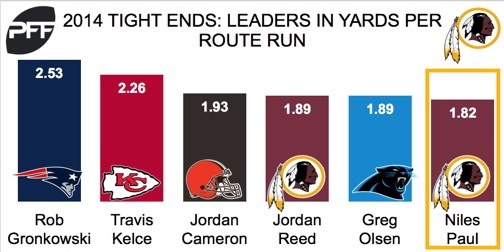 He accumulated 139 of those yards on deep passes (passes that travel more than 20 yards in the air), which was the sixth-highest mark among tight ends that year. In 2014, Paul was hard to bring down and his 6.8 yards after contact per reception ranked eighth of 67 tight ends with at least 280 snaps. Paul ended the season with 1.82 yards per pass route, which ranked him sixth among tight ends with 30 or more targets. The Redskins traditionally carry three tight ends over the final 53-man roster. With Jordan Reed and Vernon Davis as roster locks, Paul will have to compete with draft choice Jeremy Sprinkle for a roster spot.